The House of Representatives has given President Muhammadu Buhari 48 hours to address Nigerians on his plans to effectively unravel and deal with killers across the country. The lawmakers also resolved to raise a panel to interface with the Presidency, Minister of Defence, Service Chiefs, Inspector General of Police, and other stakeholders, on permanent solution to the killings by suspected herdsmen, bandits, and uniformed personnel, and thus punish the culprits. The resolution followed two motions of urgent public importance on the "resurgence of incessant killings by alleged herdsmen and bandits," sponsored by Mark Gbillah (APC, Benue); as well as the "need to investigate the murder of Dr. Ferry Gberegbe by Rivers Police," sponsored by Kenneth Chinda (PDP, Rivers). The lawmakers said they would no longer condone incessant massacre of innocent Nigerians with impunity, despite a plethora of motions in the House and Senate, adding that they had no option than to directly engage the President who has primary responsibility to secure Nigerian citizens. They also condemned the "killing of Dr. Gberegbe, Mrs. Ibisaki Amachree and scores of others by men of F-SARS led by Akin Fakorede and the Nigerian Army respectively." 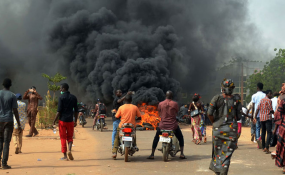 According to them, the recent killings, if not immediately checked, could lead to anarchy, which would negatively affect lives and property in the country. "We request that the President and Commander in Chief of the Armed Forces address Nigerians within 48 hours on the immediate measures he intends to employ to confront and dislodge these killers from their hideouts. "If the President fails to respond as requested, we would conclude, along with other Nigerians, that he and his administration are incapable of permanently curtailing the incessant killing of innocent Nigerians," Gbillah's motion said.